Originally published on October 2, 2015. India has placed special emphasis on the strong adverse impacts of climate change on water and on the Hindu Kush Himalayas in the country’s national climate plan submitted to the UN, also known as an Intended Nationally Determined Contribution (INDC). The Hindu Kush Himalaya is also called ‘the third pole’ because it holds the largest store of fresh water after the North and South poles. The world’s tallest mountain range is the primary source of water for most of Asia, including three river basins crucial to South Asia – Indus, Ganga and Brahmaputra. thethirdpole.net has consistently reported on these links and also on the need for better cooperation between Asian countries on transboundary river basins, another point mentioned in India’s INDC. Submitted in the early hours of the anniversary of Mahatma Gandhi’s birth – October 2 – to the United Nations Framework Convention on Climate Change, India’s national plan identifies water as the “most critical component of life support system”. The NWM is one of the eight missions under India’s 2008 National Action Plan on Climate Change. Now the government plans to add four missions or programmes to the plan. India is the world’s largest groundwater user, resulting in a steep decline in many water tables across the country. The INDC talks about the importance of rainwater harvesting. The government has recently approved a programme called Neeranchal to push watershed development. And then there is the National Mission for Clean Ganga which has activities such as measuring and policing pollution and laying sewage networks, treatment plants and so on. A National River Conservation Directorate has recently been set up with a remit to conserve rivers, lakes and wetlands in the country, plus improve improving the water quality in stretches of 40 rivers in 190 towns spread over 20 states. Climate change is also speeding up of the water cycle, which effectively means more droughts and more floods. India’s INDC points out that 45.64 million hectares of the country are flood prone. Many environmentalists are likely to be upset by the extent to which the government has emphasised hydropower in its move away from fossil fuels. India now has an installed capacity to generate 42 GW of electricity through large hydro projects, and 4 GW through small projects (up to 25 MW). The INDC says, “With a vast potential of more than 100 GW, a number of policy initiatives and actions are being undertaken to aggressively pursue development of country’s vast hydro potential.” However, it also promises to promote small and mini hydropower projects and new more efficient water mills to bring electricity to remote villages. 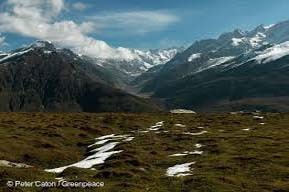 Pointing out that in India alone, the Himalaya range has 9,579 glaciers, some of which form the perennial source of major rivers, the INDC notes that these mountains are“highly sensitive to global warming”. It refers to the 2008 National Mission for Sustaining the Himalayan Ecosystem which is supposed to address issues concerning the glaciers and associated hydrological consequences; biodiversity and wildlife conservation and protection; traditional knowledge and livelihoods and planning for sustainable development. To complement this, the government is now launching a National Mission on Himalayan Studies. This is expected to build a body of scientific and traditional knowledge along with demonstrating replicable solutions to the problems of natural resource management, capacity building, long-term ecological monitoring and so on. it is for the testing only.